It's one of the biggest crafting questions many crafters have. Do I buy a Cricut Machine or a Silhouette cutting machine? It might sound silly to some people, but to us crafty people, it is a BIG decision. Now I know there are TONS of people on both sides of the Cricut vs. Silhouette fence. I've been on both sides for various reasons. I personally own both a Cricut Maker and a Silhouette Cameo 3 machine. I've used both machines and love both machines. I've also owned the Cricut Expression machine in my classroom that my students used for several years as well. 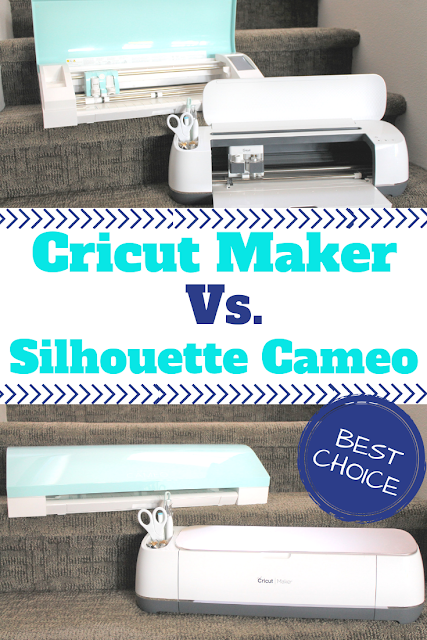 Perhaps you are wondering, how can I be a good, unbiased judge of the Cricut vs. Silhouette? Because they both have great qualities and I like them both, for different reasons. I also own both and have used both for a while. AND I'm not being paid to say these things. This is just my honest opinion of both products. So let me share with you what I can about the Cricut Maker and the Silhouette Cameo 3. To help you decide which is the best purchase for you. When you are shopping for a cutting machine, there are lots of questions you might ask. What can my machine cut? What images or files can I use? Where do I get these files? What kind of materials and accessories are available? I hope to answer these questions for you. What type of software will I need? Software is always a big question when it comes to cutting machines. 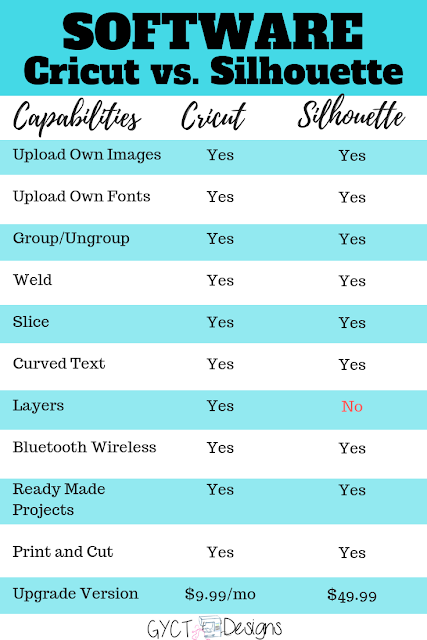 Both Cricut and Silhouette have free software that is accessible to consumers even BEFORE they buy. That's right! You can download Cricut Design Space or Silhouette Studio free before you buy and try it out. This is great because it gives you a chance to look around, try out each of the features and see what you like better. Cricut Design Space is all internet based. Which means all your files and projects are saved on the "Cricut Cloud" so you can access them anywhere including on your phone. This is a great benefit if you don't want to carry a laptop around and would rather use a tablet or phone. You can switch from one device to the other and connect them all to your Cricut Maker when you are ready to cut. You can use Bluetooth to connect to your Maker and don't even need a cord. The down side of Cricut Designs Space software is that it is internet based. That means you have to be connected to the internet to access your files and projects and to connect them to your machine. So if you internet goes down or you want to craft in the wild, you'll have to use your 4G or not cut on your machine. Here's a list of some of the features most often asked about. Bottom line, which is better? It really depends. If you are into graphic design and creating your own fonts, images and style, you have a bit more freedom with Silhouette Studio. But Cricut Design Space has really come a long way and you have more and more freedom to create, you may just have to work out a few go arounds to get it how you'd like it. However, if you want to open, cut and go, Cricut wins. This is probably the second question most people want to know before deciding on a Cricut vs. Silhouette. So what can the machine cut? Does it cut paper, vinyl, fabric? What about wood or chipboard? Can I experiment with different materials? Let's dive into these two machines. The can cut many different types of materials. This is due to the fact that they have several different blades that are used for different materials. Just like the Silhouette you can cut most paper, vinyl and cardstock with the fine-point blade, but for heavy materials you'll want the deep-point blade. However, the Cricut Maker has the Knife Blade and the Rotary Blade for cutting out wood and fabric projects like these fun fall pillows. Here's a little visual of the different blades. If you jump over to the Silhouette site, you can find what materials they recommend for cutting on their machines. The Silhouette is designed to cut a variety of materials including vinyl, paper, specialty patterned papers, cardstock, vellum, iron-on heat transfer material, fabric (when using our Interfacing products) and sticker paper among other materials. So the Cameo 3 can cut through those normal materials that cutting machines should cut through like paper, some fabrics and vinyl like this fun Valentine craft. 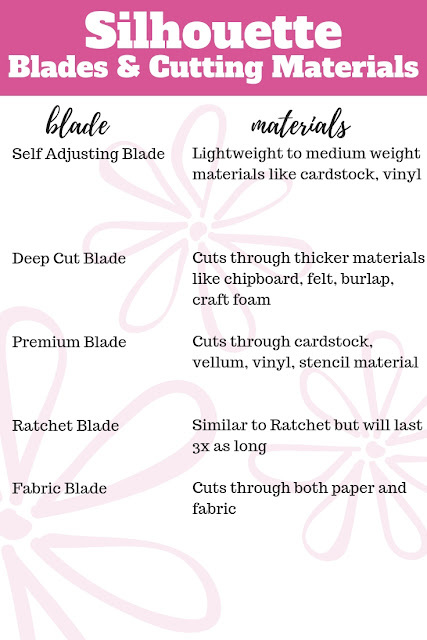 The site does say you can test and see about cutting thin metals, acetate, felt and chipboard, but warns that it may dull or impair your blade. Silhouette does have the deep cut blade that can cut through thicker materials like craft foam. Let me say one last thing about the blades. Since I am a sewing blogger, fabric is pretty much my life. I need to share my two sense about fabric blades. Fabric blades work. They aren't my favorite, but they will cut fabric. However, Cricut's new Rotary Blade is AMAZING. I'm not just saying that. It really is incredible to watch and cuts out even the finest of fabrics beautifully. If you plan to use your cutting machine for fabrics, go with the Cricut Maker. What designs and fonts are available? This is an easy question in the Cricut vs. Silhouette debate, because they both have a lot. Unlike previous Cricut machines, the Cricut Maker designs are not in cartridge form. All fonts, images and projects are available in Cricut Design Space or can be uploaded for the user. There are over 400 fonts available and 30,000 images in Cricut Design Space. If you don't wish to sign up for Cricut Access, you can purchase fonts and images individually or upload your own. If you do sign up for Cricut Access, you also receive 10% off any of your purchases at Cricut.com. Many complain that they believe Design Space limits the amount of space you can use and cut out. With Silhouette machines you can cut long vinyl without a mat, however, in Design Space you can cut out large images as well. The Cameo 3 usually comes with a set of free designs and after purchasing a Silhouette, you may get credit to use in the Silhouette Store. Any fonts or images you already have on your computer can be uploaded to Silhouette Studio and used. You can also purchase more fonts, images and projects in the Silhouette Store or find items online to purchase. I grabbed this fun design and cut out a Reverse Canvas Project using my Silhouette. Bottom line, both Cricut and Silhouette have LOTS of images and fonts available right from the beginning. You will have to purchase some or sign up for access. 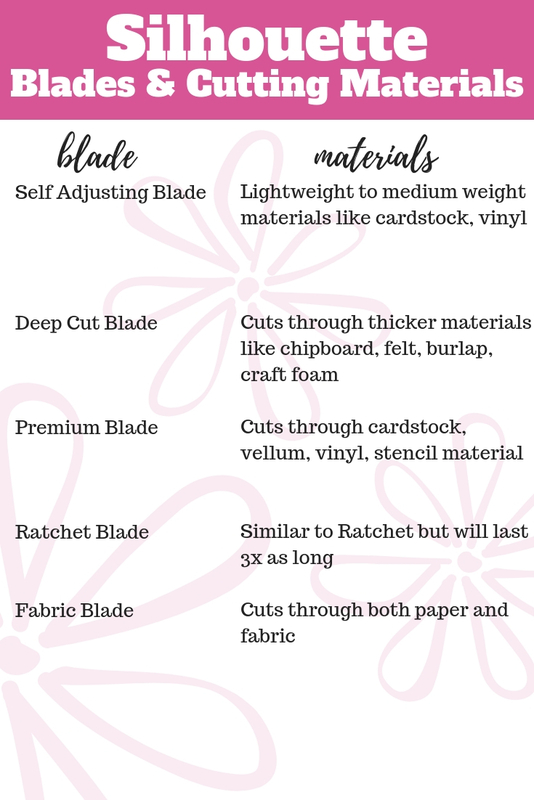 What types of accessories and materials are available to use with my cutting machine? Both Cricut and Silhouette have many accessories and materials available specifically for their machines. They are tested to work with their product and are rolled out each year big and better in many cases. Here are just a few of my favorites. Cricut has SO many cutting materials it can be a bit overwhelming. However, here are a few of my favorites. Everyday Iron-On - Cricut has tested and re-tested their iron-on to make it the best. Their new Everyday Iron-on will outlast 50+ washes!!! I love making t-shirts for my family with iron-on. EasyPress 2 - If you are in the market to use Iron-on, you'll want a heat press and the new EasyPress 2 comes in 3 sizes. Plus, it is portable! You can take it anywhere and craft away. I have both the mini 6x7" and extra large 12x10" and LOVE them. Riley Blake Quilt Kits - if you are a quilter or want to learn to quilt, the Cricut Maker is your machine. You can see my first quilt I've made with my Maker here. You'll love these quilt kits. Everything you need to cut out your quilt on the Cricut Maker. Chipboard - No need to head to the hardware store, just grab this chipboard, cut out the design you want and your are ready to craft. Genuine Leather - I love this leather. It is beautiful and cutting it out on the maker is AMAZING! Silhouette has some really fun products besides just vinyl and heat transfer vinyls. These are great for all kinds of projects. Tattoo Paper - Wouldn't this be a fun party favor or a little handout on a business card. Printable Heat Transfer Paper - Instead of cut out your design, print it out and then cut it. Scratch Off Stickers - I love this. Make a custom card that individuals can cut out and scratch off for a prize or surprise message. Silkscreen Starter Kit - I really want to try this. It is a new product from Silhouette. If you have lots of t-shirts to make, cut out a stencil instead and paint your tees the traditional way. What about the cost of the Cricut vs. Silhouette? All three of these come with the basics like cords, a cutting mat and a blade. There are many bundles that you can get, especially on Amazon that include vinyl and even some ebooks to walk you through using the products. These are also really good deals and will help you get started even faster. If you just look at prices, the Cameo 3 looks like the right choice. However, don't forget about the many capabilities of the Cricut Maker. 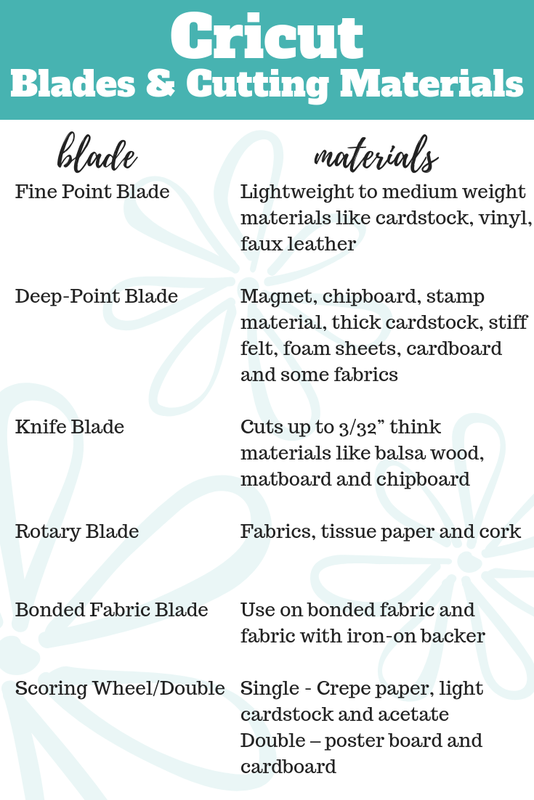 With the many new blades like the knife blade, rotary blade and scoring wheel, there are so many possibilities that make your crafting faster and easier than ever before. Don't just look at price. Make sure you are thinking about what you plan to create with your Cricut or Silhouette. Remember that you will only receive a blade, maybe 2 with your actual machine. You will have to purchase other blades and products. Think of all the amazing items you could make with the different blades for both machines!! Another tip, if you can wait, shop the Black Friday deals. I bought my Silhouette in a Black Friday deal and got a really good deal and a bunch of awesome starter products. So what is the take away? You have to know what you want to do with your machine. If you want the ease of opening, setting up and cutting right away, the Cricut Maker is fast, friendly and easy to navigate. If you want immediate design freedom, the Silhouette Cameo 3 will give you that. Both machines are great and you will get great results with each. But like with all projects, you need to take your time and know that snags will happen. So what is my choice? I really love my Cricut Maker. Mostly because I can do SO much with it quickly. And since I have had lots of time to work with the software, I can be very creative and make loads of custom projects, uploading my own images and fonts and still have a lot of creative freedom.